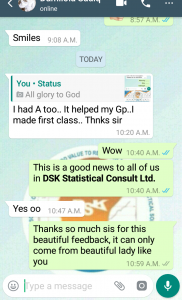 Testimonials – DSK Consult Ltd. 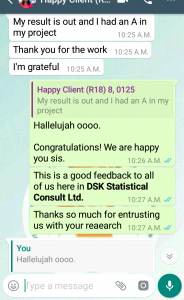 I saw DSK advert online, then I risk my job by trying them, I outsourced my work to them, they surprised me, they delivered excellent job and even before agreed time. And since then I have been their returning client and I am always happy to recommend them. 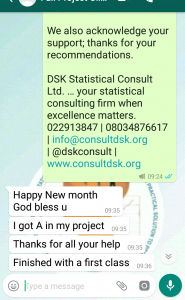 DSK Statistical Consult Ltd. is God sent, since I started doing business with them in 2012 I have NO regret at all. 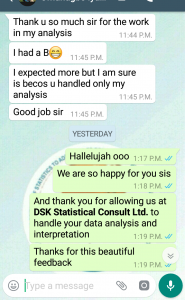 The analysis part of every of my papers published internationally and locally are perform by DSK Statistical Consult Ltd. Another thing is their ability to interpret the statistical result to fit your work. They are brilliant. humble, skillful and godly. Everybody I have recommended them to come back to thank me. 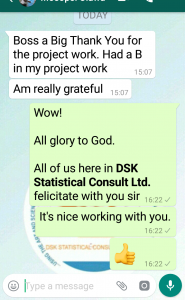 I just tweeted that I need somebody that can help me work on my data analysis and somebody mentioned @dskconsult, and within a couple of minute @dskconsult tweeted me, telling me I need more than somebody that can do statistical data analysis, that what I needed is a statistical consultant. To cut the long story short, I was skeptical about them but I gave them my work. 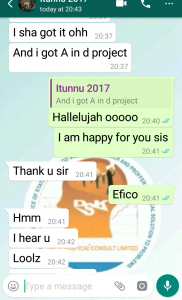 They over perform, my supervisor commend their work and directed other postgraduate students to DSK Consult Ltd.
We started and completed the work online (Twitter PM, Email, WhatsApp chat, and I called them just once), I did not meet any of them physically till date, I am in United Kingdom and they are in Nigeria. These guys are efficient and effective. 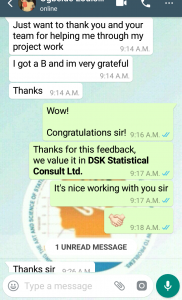 I was recommended to work with DSK Statistcal Consult Ltd. to better define my data analysis. They took the time to review my hypotheses and methodology and determined the best approach to analyze the data and present the results. 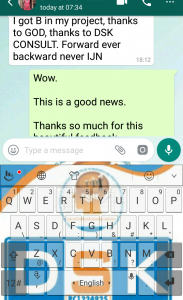 They said distant is not a barrier I did not understand until I started calling and mailing them, infact, it was not a barrier at all, they were also available to answer questions correctly every call. They were extremely helpful, patient, kind and ethical. In addition to being an excellent teacher, they never treated me in a condescending way. 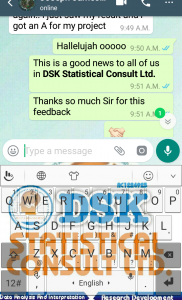 I was very satisfied with their service, they completed my statistics in about 5 days, and provided step-by-step results I would highly recommend DSK Consult Ltd.. 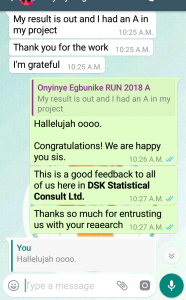 I initially thought I wouldn’t be able to submit my final year project due to lack of data and a good statistician to run my chapter 4 (data analysis) because it was late and my topic a bit strange, but DSK Statistical Consult Ltd. made it easy by working extra hours for me and I was able to meet the deadline for submission. 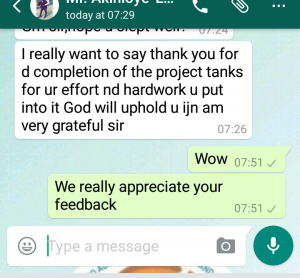 All thanks to Hon. 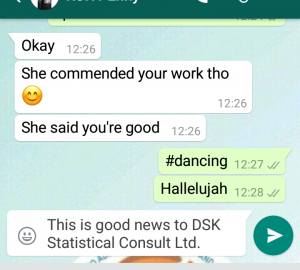 Psalm the Chief Statistical Consultant. I came across Hon. 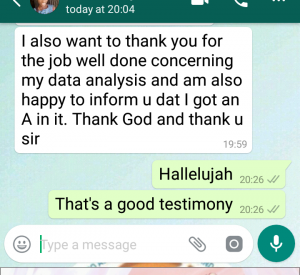 Psalm after an extensive search for a statistical consultant to help me with the statistical analysis in my undergraduate project. I have always struggled to get to grips with statistical analysis, so even though my descriptions may have been vague, he quickly helped me figure out what needed to be done. He was available to talk to via email or over the phone frequently and explained every step of the analysis to me in understandable terms. 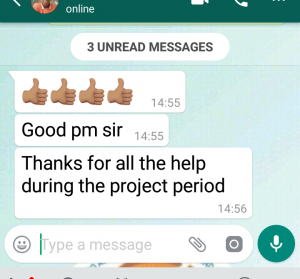 He provided me with what I needed very quickly and I was able to submit my finished project with a professional results section I would never have been able to achieve alone. I would highly recommend him to anyone in need of help with statistics. 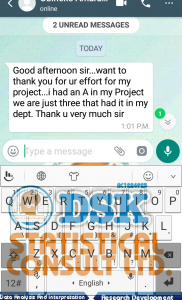 At first when I heard his price I thought it was much but in less than a week I knew the money was less compare to the value, being a Statistician, he handled my work professionally and made my supervisor liked me and enlist me to defend at the external defense. He’s good at what he is doing. Kudos. Thumb up! I worked with Samuel for about 3 months on my thesis paper for my masters degree. I found him to be very personable! He was above and beyond exceptional in his professionalism and knowledge of statistics. Samuel took the time to read through my entire paper, determine what was needed and searched for data sets to provide a detailed analysis and prove my hypotheses. The tables he put together to present the statistical analysis were so professional that I was asked to cite which source they came from! He was easy to contact, always provided helpful ideas and suggestions, and he offered very reasonable rates. My university thesis instructor was very difficult to work with and provided little if any explanation for revisions he wanted for my paper. 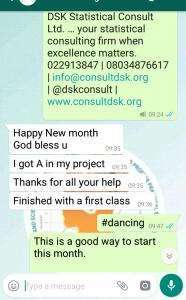 Samuel worked tirelessly to translate what the instructor was looking for and he provided timely responses and quality work, no matter how many times I returned to him for help. Even when I just wanted to give up, he encouraged me to keep working toward my goal! I most certainly could not have produced the quality paper that I submitted without the support of Samuel. I would HIGHLY recommend Hon. Psalm (as he loved to be addressed) to anyone in need of assistance with statistical analysis for a paper/dissertation/thesis! I also call him my life coach. He’s good. 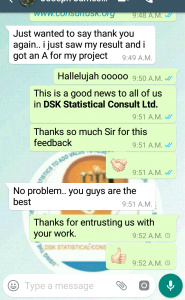 DSK Consult Ltd. works with state-of-the-art data collection and survey methods to ensure the highest quality data for our clients. 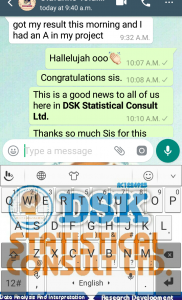 DSK Consult Ltd. is a company with multi-mode market research capabilities, we collect data from multiple sources, anything from mobile to mail. We are a one-stop-shop for all data collection, field surveys, and applied research. We have a pool of hundreds of experienced enumerators that are readily available to fulfill the most complex tasks. We use a mixed methodology approach to give our clients options and access to reach any target with greater accuracy and speed. Understanding the market is the key to any successful business, but there are many different ways to ultimately gain that market intelligence. Let’s use statistics to increase your profitability and reduce your expenses. 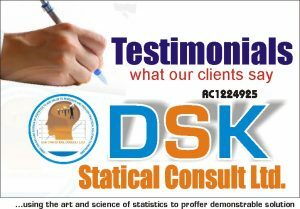 At DSK Consult Ltd., we design experiments for new products, conduct focus groups and sample surveys to gather customer feedback, and perform field experiments in test markets to determine produce viability and marketability. Let’s analyze your sales data and predict future trends. 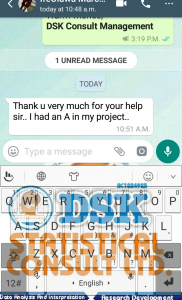 With our knowledge in Statistics, Data Analysis, Data Science, Machine Learning, Market Research, Market Analysis, Financial Analysis, efficient use of recognized statistical software (like SAS, SPSS, EViews, R, Minitab, Python, MS Azure ML studio, STATA, Gretl, MS Excel, etc) and more than 6 years experience of meeting statistical needs of academic researchers and businesses across the globe, we are in the best position to handle your (personal or organisational) data analysis. If you have data to analyze, and you understand the language of excellence, then you need our service. 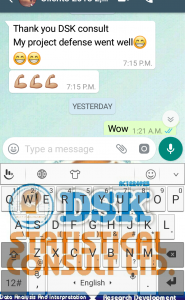 Copyright © 2019 DSK Consult Ltd..